There are many performances of the first movement on Youtube. Meanwhile, the score is easily and freely downloadable from IMSLP. Click on the image to get the full scores in PDF. Since the students in my morning piano class all managed to sightread the easy version in C major yesterday morning, I was tempted to arrange the original version in G as a transposition exercise. As students span many levels and I prefer a fuller sound, I adapted the famous opening for my two classes to try tomorrow. 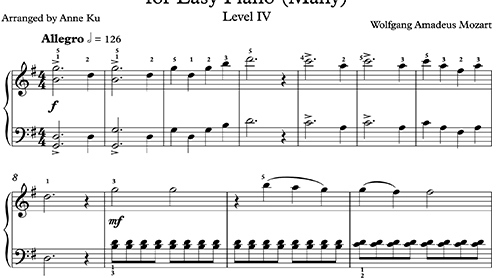 The following are arranged for four easy pianos. Each is independent of each other. As we have 20 digital pianos and two grand pianos in our classroom, we can easily spread ourselves into the four different levels. Level I is the easiest, using both hands to play the melody but reading both in the treble clef may be troublesome for some (excuse the pun). Level II is slightly harder, with the bass line. Level III includes the harmonic accompaniment of the second violin. Level IV fills in the rest of the harmony, below. 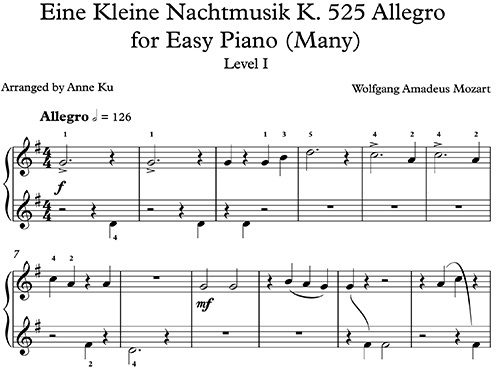 “Eine Kleine Nacht Musik” would be a wonderfully light and happy piece to both learn more about Classical Music, and in learning play piano. What could be better then thru one of Mozart’s most charming serenades? Previous Previous post: So nice!